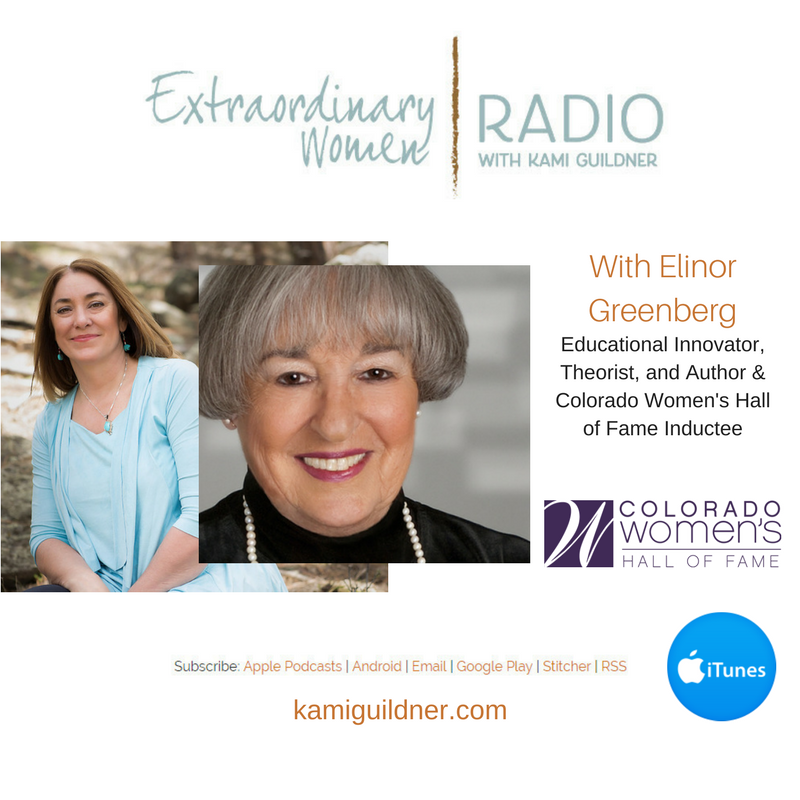 Today on Extraordinary Women Radio, I’m really honored to host another Colorado Women’s Hall of Fame Inductee – Elinor Miller Greenberg. Elinor is an educational innovator, theorist, and writer who impacts education, civil rights, and women’s rights locally, nationally, and internationally. A visionary, Elinor believes that education is the key to social change and social justice. At 85 years young, Elinor shares lessons she’s learned over her change-impacting life. She shares the story of how she became an activist as a momma with a baby on her hip, and how she lived by the mantra, “Go where no one else will go. Do what no one else will do.” She loves being her current age and offers third-life wisdom. She’s got grit, she’s got grace, and she’s certainly made an impact on our world. I especially enjoy our conversation about how she has built friendships across political lines, with people she has been friends with for over 50 years. An important lesson for all of us in today’s modern age. Elinor has an impressive list of accomplishment in her lifetime. Here are some of the highlights! As a national leader in adult education and adult development, Elinor has worked with the major colleges and universities in Colorado and was also a guest faculty member of the Harvard University School of Education Institute for the Management of Lifelong Education. She has authored, co-authored, and edited nine books and more than 200 papers. Greenberg was one of the first to create learner-centered educational programs in Colorado, heading University Without Walls, an individualized bachelor’s degree program for adults utilizing resources from the community. She served as the national coordinator for the program and later was the regional coordinator for the Council for Adult and Experiential Learning and founding director of Project Leadership. She created the first BSN weekend college for rural nurses in Colorado, established a bachelor’s degree program in Colorado prisons, developed degree programs for Native American mental health workers, and founded a prepaid tuition program for US WEST employees in 14 states. At the University of Colorado Health Sciences Center, she established the Mountain and Plains Partnership to provide access to online master’s degree programs for nurse practitioners, nurse midwives, and physician assistants in underserved areas of Colorado, Wyoming, New Mexico, and Arizona. Greenberg came to Colorado in 1954 to work as a speech therapist and quickly became a community activist, finding ways to provide access to opportunity for women and minorities. She has been in the forefront of the fair housing effort for more than 40 years and served on numerous commissions and boards, including the Colorado Women’s Economic Development Council, the Colorado Women’s Leadership Coalition, Women’s Forum, State Board for Community Colleges and Occupational Education, the Anti-Defamation League, the Colorado Board of Continuing Legal and Judicial Education, the Colorado Judicial Institute, and MESA. As a nationally known public speaker, writer, and consultant, she founded Colorado-based EMG and Associates, a consulting and publishing firm specializing in adult education and distance learning. You will love this interview with Elinor’s deep wisdom. Let’s meet Elinor Miller Greenberg!